Reebok Stealth 8" SWAT Boot with Side Zipper Style C8894. 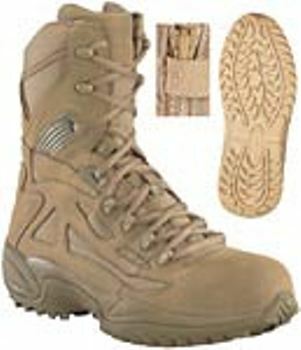 This Coyote Tan boot feels like a tennis shoe because it is light weight and flexible yet gives our brave soldiers and law enforcement personnel safety and stability. Easy to put on with the side zipper! We also sell this boot in BLACK. These boots fly in and out of our store and are constantly on order, so expect a 5 day delay in shipping. You'll have your boot in hand within 10 days. Note: This book used to be manufacturered by Converse, Reekbok purchased converse so all labeling is now Reebok, same boot.